Photos from completed missions. Click on a gallery or a picture to view images. Another way you can help PGRPA is when shopping at Amazon. 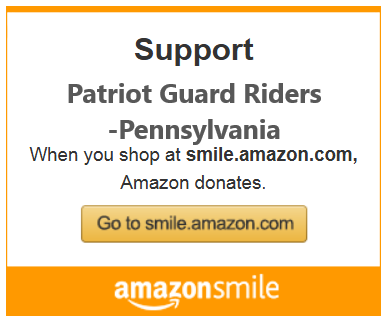 Every time you use smile.amazon.com a portion of the sale goes to PGRPA! Thank You! 10:30 am – 11:30 am, April 25, 2019 – (Short Notice) SGT 1st Class Michael Phillip Pristas US Army Vietnam Veteran Chambersburg Pa. Copyright 2010-17 Patriot Guard Riders Pennsylvania (a 501.c.3 Corp). All Rights Reserved. Our site is designed to help the state membership with their missions of our fallen and wounded patriots, past and present, and under the affiliation and guidlines of the National Patriot Guard Riders. National PGR supercedes this site.